I don’t normally go for desserts, unless they’re included in the Restaurant Week menu. 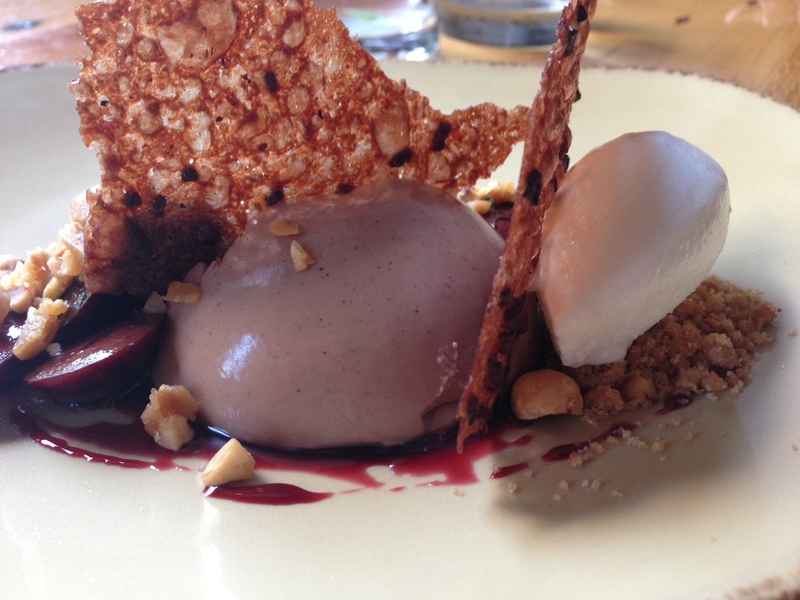 But the sweet and salty combos offered at Nostrano made for a pretty exciting dessert menu. 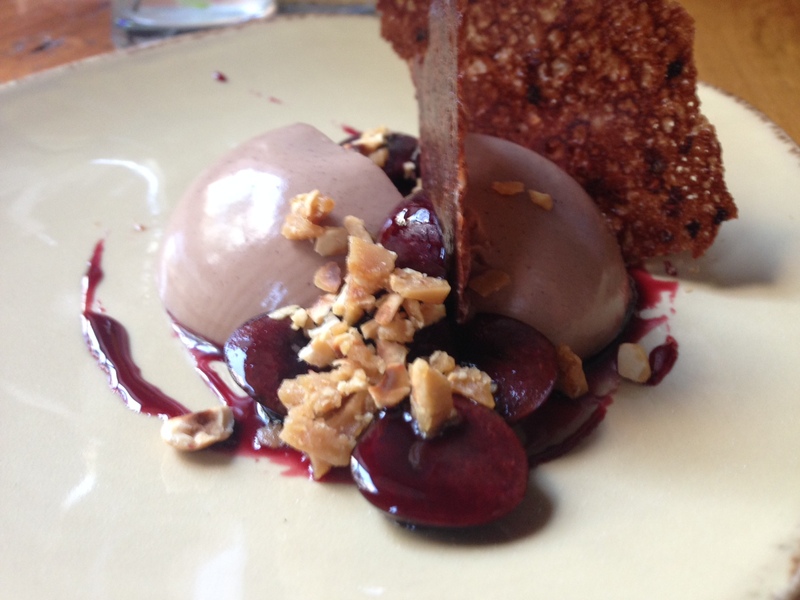 A friend and I went just for the desserts and split the gianduja chocolate panna cotta. When the dessert was delivered the first thing I noticed were chocolate crisps and small little chunks of glazed goodness. The glazed goodness ended up being toasted hazelnuts and toffee, which were amazing with the chocolate panna cotta. And the cherries were simmered with black pepper, which took down the sweetness factor and added a good savory element. FOOD NOTES: Based on the yummy balance of sweet and salty, and creamy and crunchy Nostrano uses in their desserts, I hope to be blogging about their dinner menu sometime soon! O.S.S. opened this year in a little brick building on Regent Street that has been vacant for a while. O.S.S. by all technical definitions is a sausage shop and the name can mean whatever you want it to mean – Old School Sausages, Open Source Sausages…they even take suggestions from customers. But no matter what O.S.S. means to you, it will also mean awesome sausages, fresh cheese curds and perfectly crispy hand-cut french fries. Plus, the menu uses locally sourced sausages and cheeses, which I absolutely love! 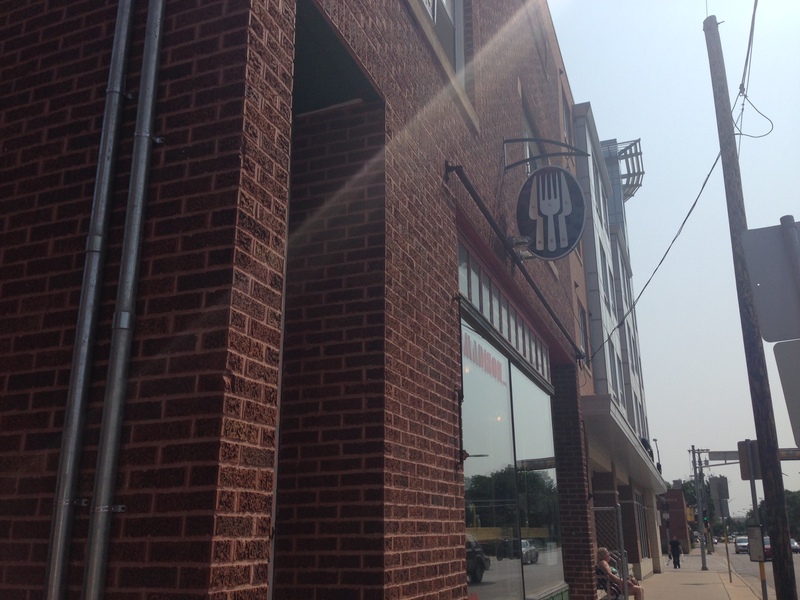 The tiny brick building is conspicuously signed with a side entrance and a hidden back patio. 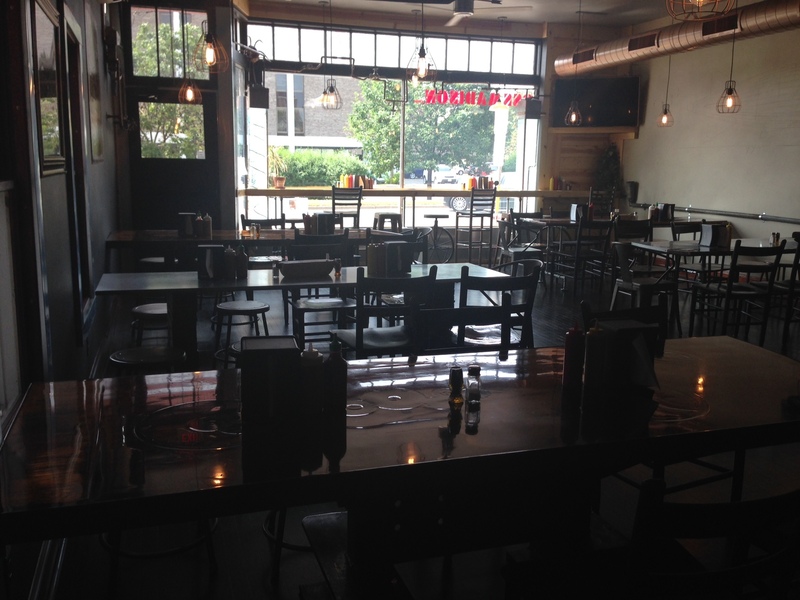 The dining room is flanked on both sides by long, communal tables with a mix of chairs and stools. 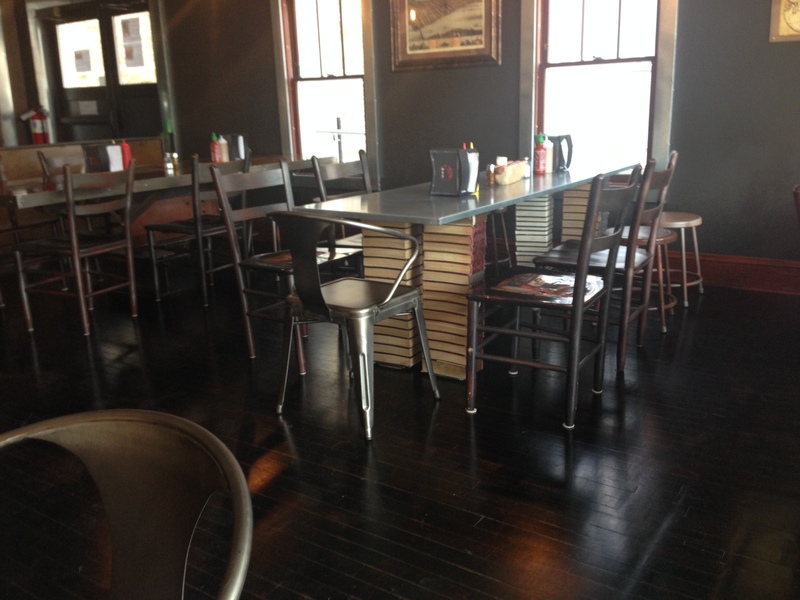 The entire place has a unique, industrial feel to it with warm touches — the legs on one of the long tables is made out of a stack of books! There’s also a whimsical feeling because they won’t really tell you what O.S.S. stands for, yet you can find the initials and possible definitions scattered throughout. 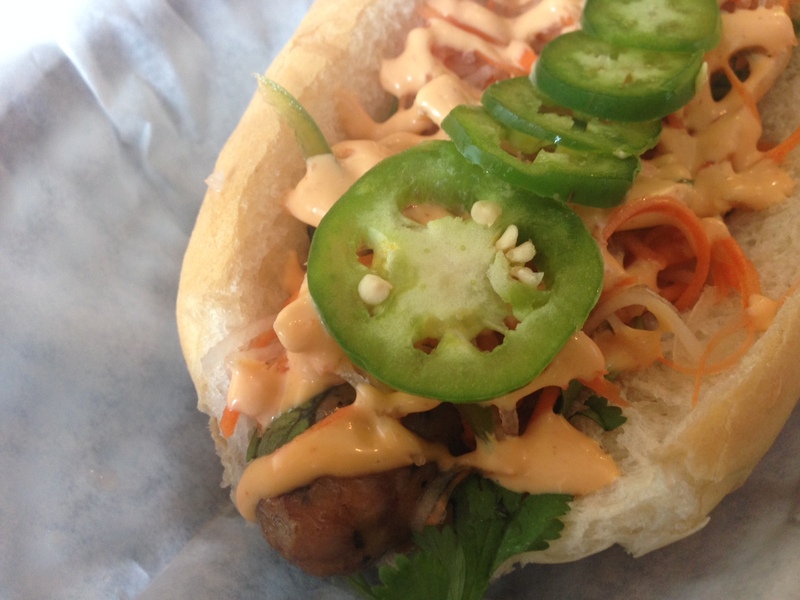 The bahn mi sausage, which the manager said is one of their best sellers, had some real potential. The sriracha mayo added a great spice to the heavier sausage, and the cabbage slaw gave the entire thing a much-needed crunch. I could have done without the cilantro, and the whole jalapeno slices could have been cut smaller as to avoid an entire mouthful of unbalanced spice. But the slaw mixed with the mayo and sausage was a great combination. The traditional Chicago dog was pretty awesome. 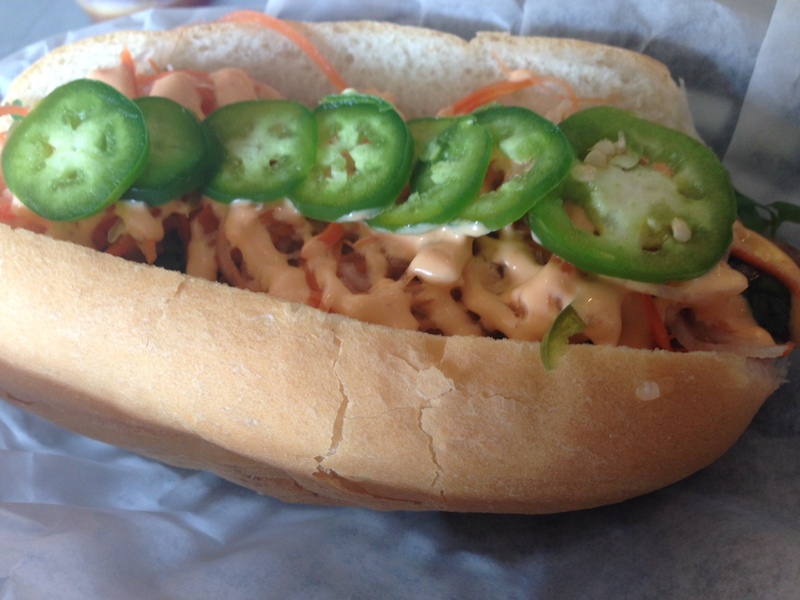 It is a traditional hot dog with tomatoes, onions, relish, a pickle, celery salt, sport peppers and mustard. The hearty bun was just the right size to contain all of the top-notch ingredients. The peppers and the pickle added a great spice and saltiness to the dog, and the freshness of the tomatoes and onions was very welcome. 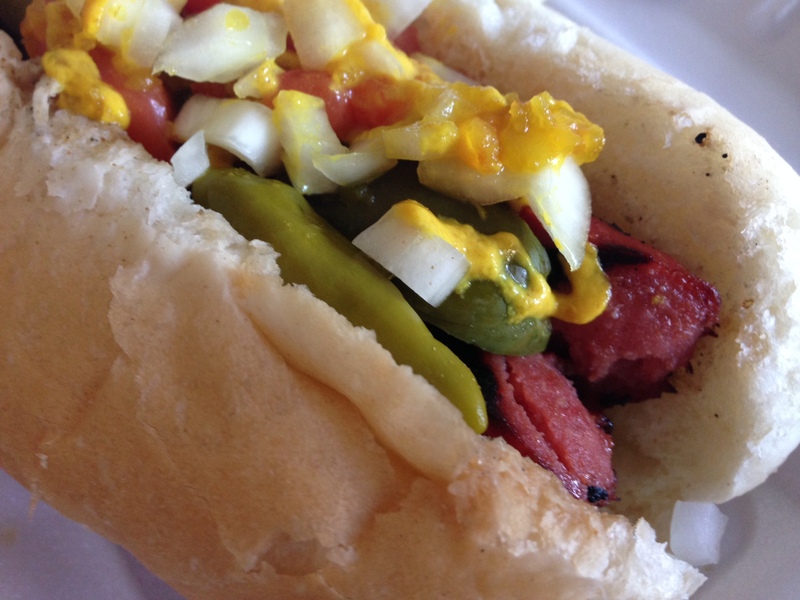 I’ve never had a Chicago dog in Chicago, but I can’t imagine they could be any better. 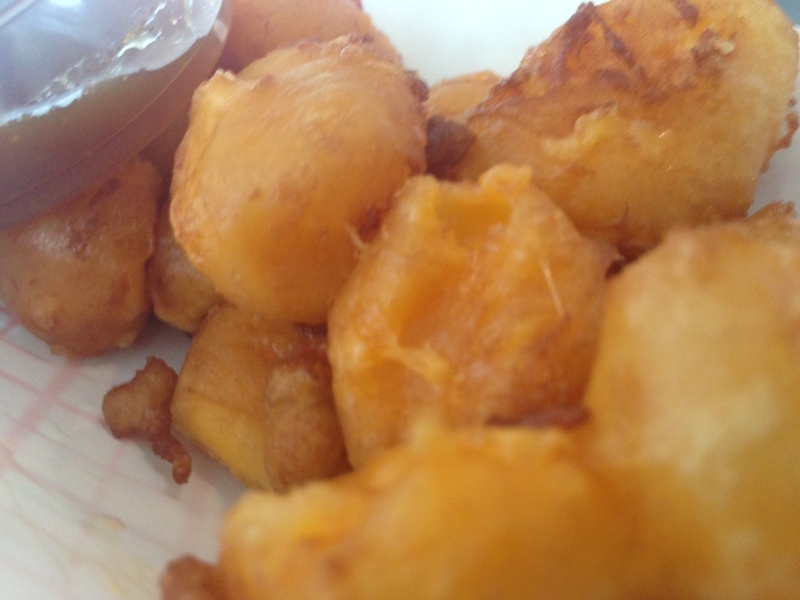 The hand-battered cheese curds were pretty phenomenal. They were stringy and melty with a perfectly light and crunchy batter. 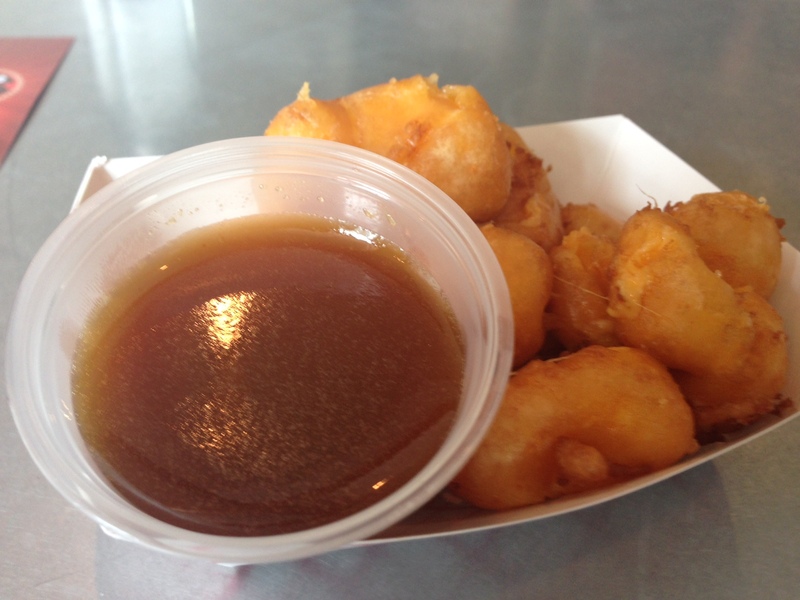 They were probably the freshest fried cheese curds I’ve ever had. The manager told us you can also order them spun in sauces, like chicken wings…which sounded very interesting, but we opted for the traditional curds. The curds came with a special sweet mustard from the National Mustard Museum. The mustard was sweet and a little tangy, but the curds were good enough on their own. 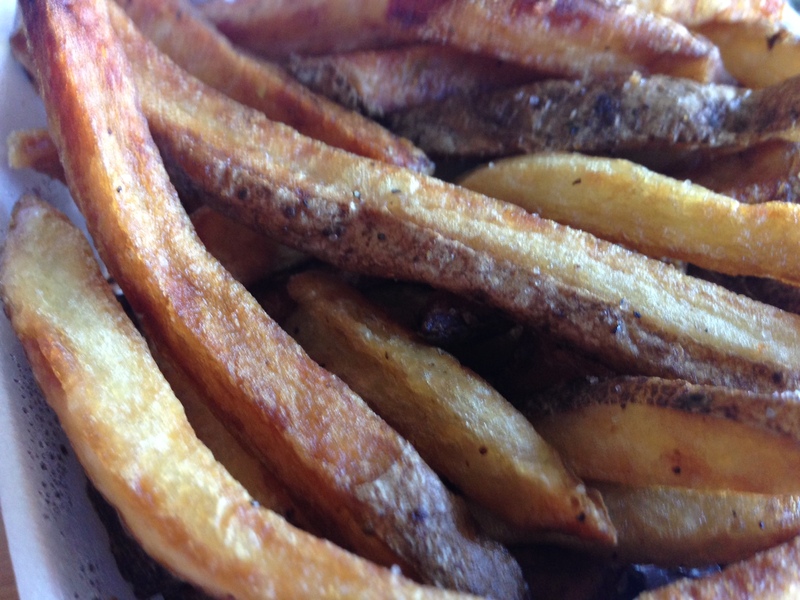 The hand-cut fries were just as prefect as french fries can get. The fries still had the skins on them, and all of them were crispy on the outside and fluffy on the inside. The entire batch had just the right amount of salt, and they even came with a stray cheese curd! 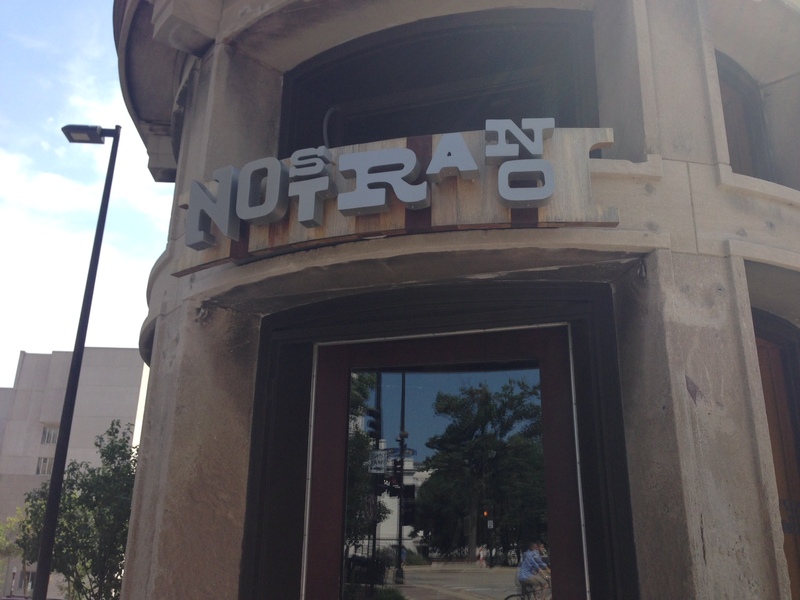 FOOD NOTES: This sausage shop is an awesome addition to the Regent Street area. Regent Street has never been a food destination for me, and O.S.S. really changes that. Their take on traditional cheese curds and hand-cut french fries shows that making fried sides fresh and with quality ingredients really pays off. I enjoyed both sausages I’ve tried, but I really want to try some of their special dogs they’ve posted on Facebook (Swissco Bacon Mac Dog, the Assadura and the Tikka Masala…yum!). I’ve been trying restaurants during Madison Magazine’s Restaurant Weeks for four years, but my last stop during this summer’s Restaurant Week was by far the best meal I’ve gotten off of a Restaurant Week menu so far. 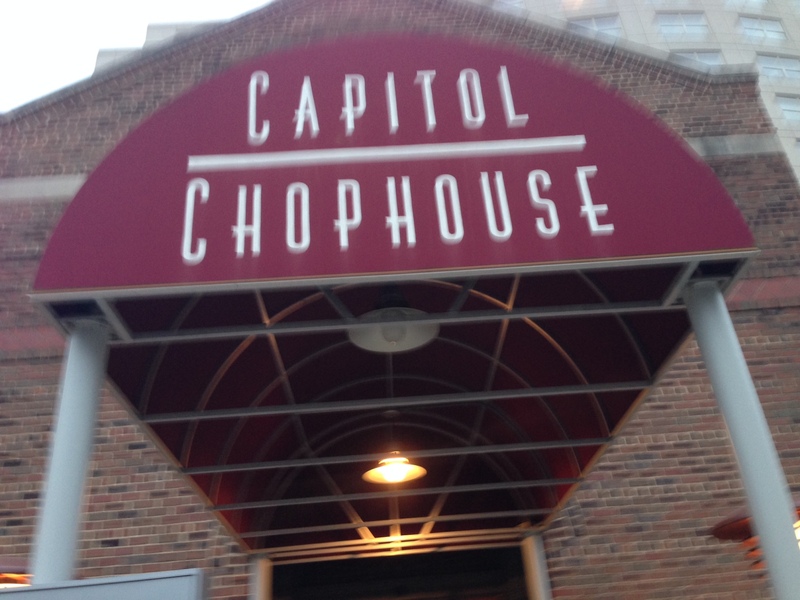 Capitol Chophouse is a slightly hidden restaurant that is attached to the Hilton Hotel right off the square near Monona Terrace. The dining room features big leather booths and dark wood walls, with clean white linens and classic dishes. It feels like a high-class supper club, even though it’s attached to a hotel. 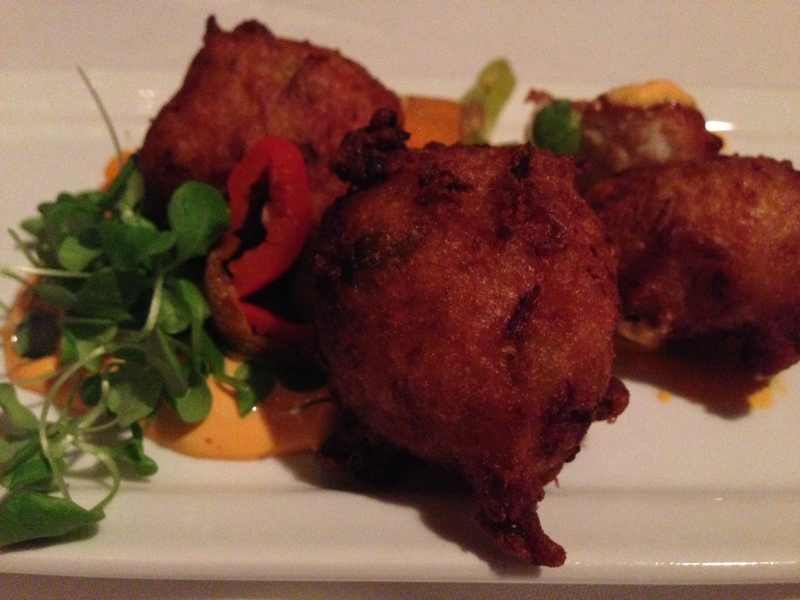 For restaurant week the appetizer choices were a market tomato salad, smoked salmon fritters and French onion gratin. My friends got the smoked salmon fritters and the market tomato salad. Both were happy with their choices. I got the French onion gratin. 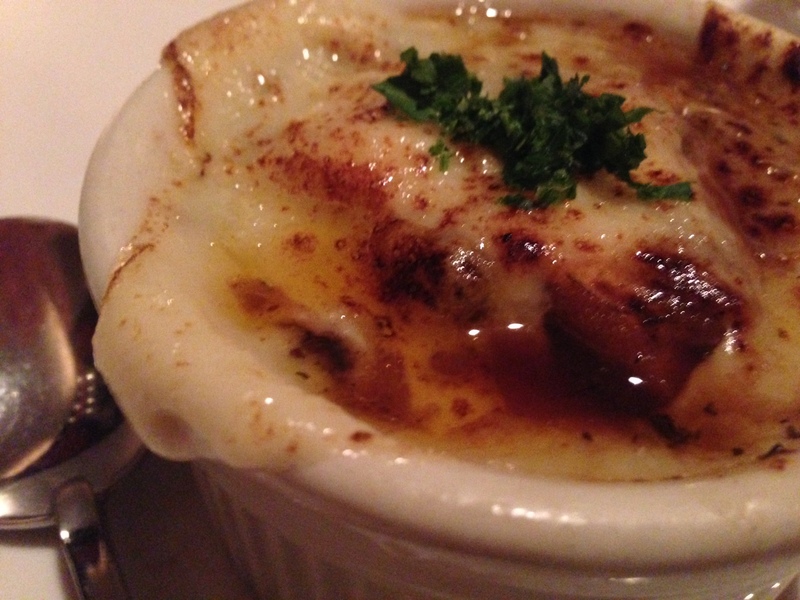 I’m not sure what I was expecting when the menu said the appetizer was a “gratin” but it was basically baked French onion soup. Admittedly, it was the best French onion soup I’ve ever had. The onions and the broth were so flavorful with the perfect balance of onion flavor and savory broth. The chunks of bread inside the soup were not too mushy, which means it was probably made-to-order. And the swiss cheese melted on top was thick, creamy and didn’t have too much of a strong swiss flavor. 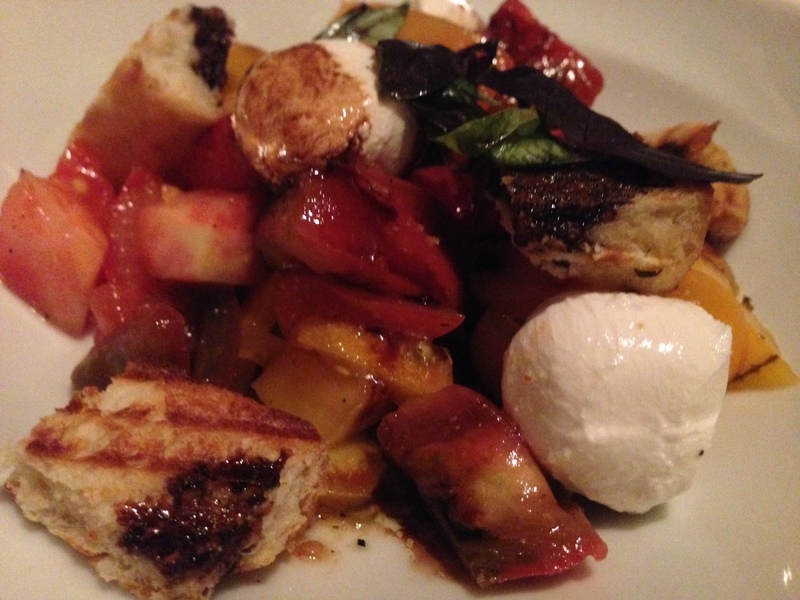 It was a perfect first course for my final summer 2014 Restaurant Week meal. For entrees they were offering a New York strip steak, roast Berkshire pork and Alaskan halibut. 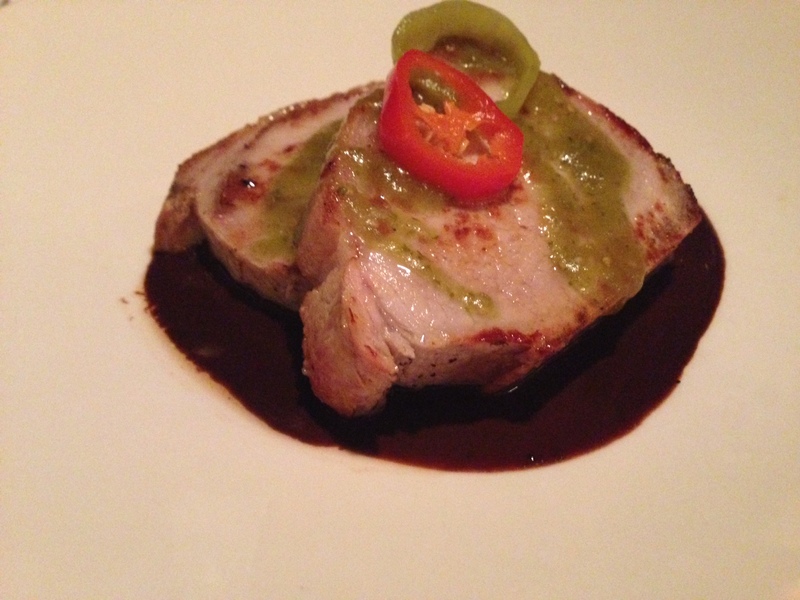 The two extremely generous slices of roast pork came on top of coffee mole sauce that tasted odd on its own, but paired very well with the perfectly cooked pork. 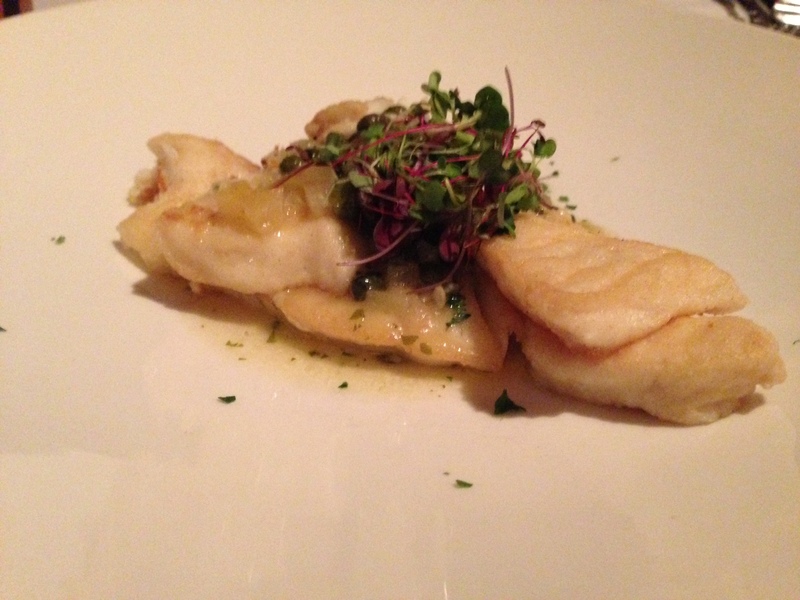 The two equally generous pieces of halibut came in a white wine butter sauce with capers on top. The fish was also cooked perfectly, and the sauce was pleasantly light despite its name. Since we were in a chophouse I opted for the New York strip steak. Unlike my previous steakhouse experience that week, the people running Capitol Chophouse’s kitchen definitely knew how to cook a medium rare steak. The chimichurri vinaigrette that was drizzled on top added a good tang. The amount of the sauce was perfect. 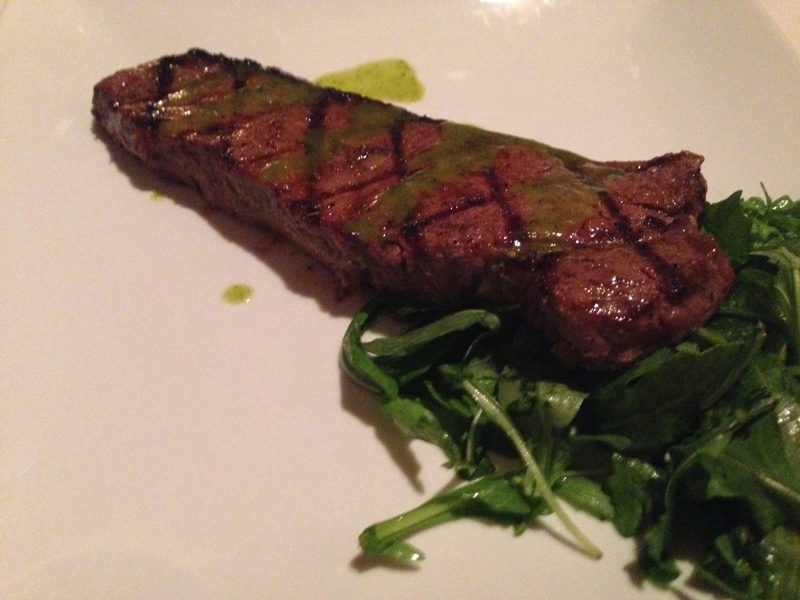 There was just enough to taste it, but I was still able to taste the perfectly charred and seasoned steak. In addition to this being the best Restaurant Week meal I’ve ever had, it was also the most expensive. 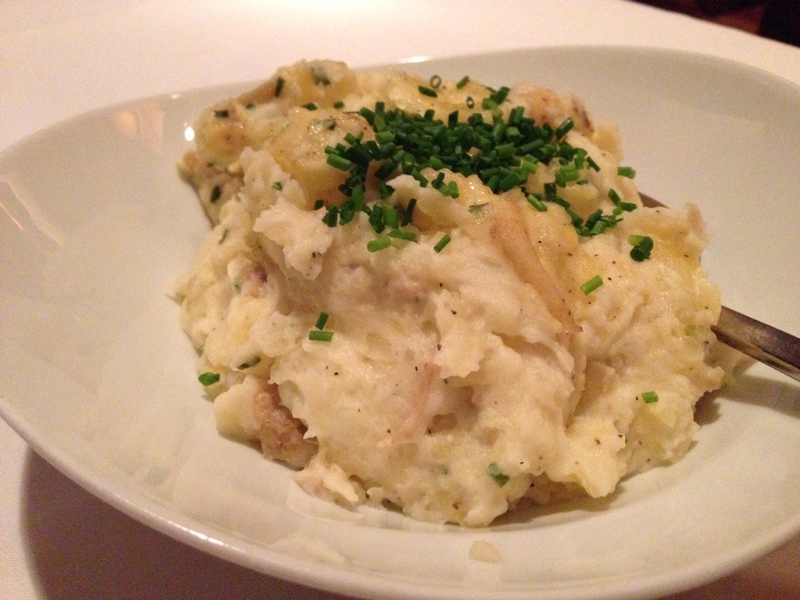 Because the menu at Capitol Chophouse is served a la carte, we had to order our sides separately. With some guidance from one of the servers, we ordered two sides to split between the three of us. I’m glad we decided to split the sides because what was delivered can only be described as a serving bowl of family-style sides…definitely not an individual serving. I was also excited to try more than one side. The mashed potatoes were just the way I like them – made with red potatoes with the skins, a little garlicky and a little lumpy. For our second side we got the lobster mac and cheese (forgot to take a picture…sad), which was super decadent. It is al dente elbow macaroni smothered in a rich cheese sauce with chunks of lobster sprinkled generously throughout. I could have made a meal out of just the sides, but I’m glad I didn’t! 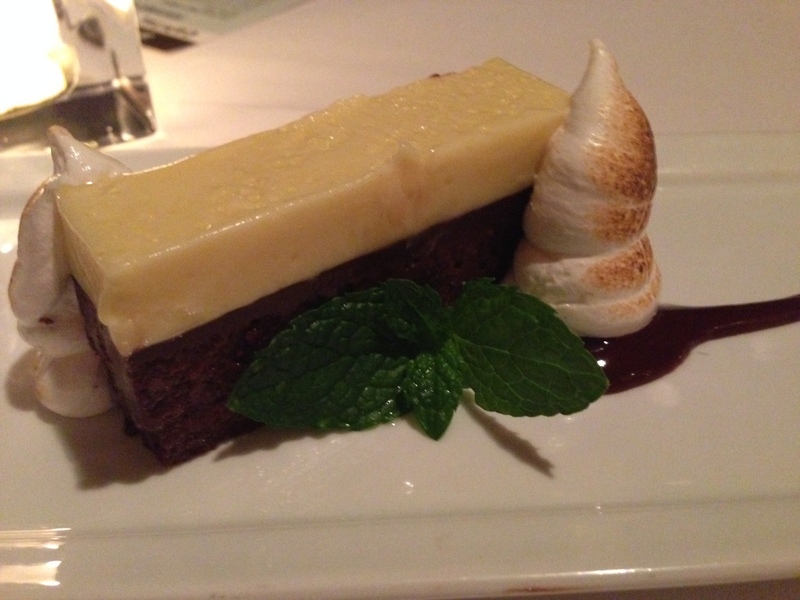 For desserts we could choose between a chocolate terrine, a Wisconsin cheese plate or peach cobbler. One of my friends got the chocolate terrine, which was this thick chocolate fudge-like substance topped with another white custardy substance. Both were extremely good. There were also little fluffs of toasted meringue on the side. Two of us got the peach cobbler. The cobbler had to have been baked to order, because it was so hot, when we broke into the crust steam started pouring out. The vanilla bean ice cream was melting so fast mine started dripping dow the side of my ramekin. I’m not the biggest fan of peach, but this dessert made me forget that. The peaches were in a light sauce that wasn’t too sweet or syrupy, and the crumbles on top were crunchy and tasted vanilla-y and hardy. The combination of the hot cobbler with the vanilla bean ice cream was a home run. FOOD NOTES: There were so many high points to this meal, I’m not really sure where to even start. The atmosphere was great. The service was good, but not overbearing. My appetizer, entree, sides and dessert were phenomenal. I was extremely happy with everything, and I wasn’t even upset with the price of the meal, because I did take leftovers home. 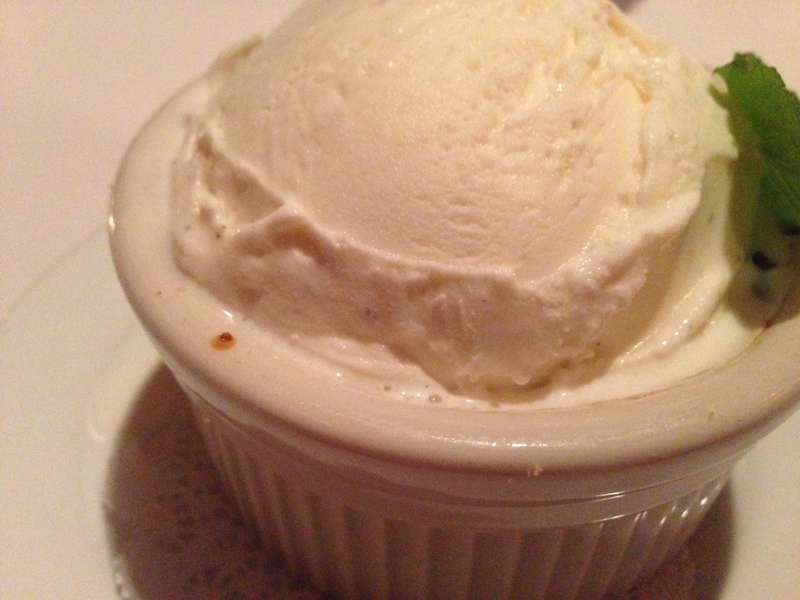 I’m more of a savory person over sweets, but to this day I think about that peach cobbler and ice cream dessert.